Everyone has a story to tell, and with this app, stories are called “gamis”. That’s why the app is called Tellagami…you create an avatar, and then tell your gami. Get it?! 🙂 I LOVE this app for its simplicity. Users create an avatar by choosing the gender, skin color, eye color, hair color, clothes, and facial expressions. There are default backgrounds, or you can upload your own. Users can then place their avatar anywhere on the screen, then just hit record. You can either type what you want the avatar to say, or you can record your voice. Each gami can last up to 30 seconds, but if you want a longer story, you can use YouTube’s video editing tools to put them together into one video (check back next week on Thursday for a post about YouTube editing tools). Here’s a gami I created advertising a local Tech Express session. This Chrome Extension is super easy to use and perfect for the classroom. When you click on the icon in your tool bar beside the omnibox (formerly known as the address bar), the timer will appear. Simply click the time that you want it to begin counting down from, and it will starts automatically. 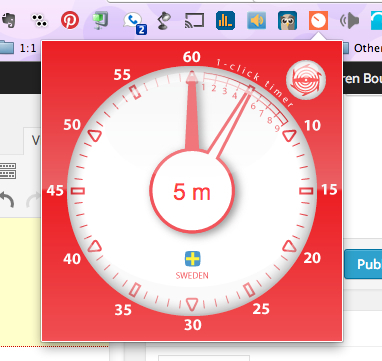 When you click outside the timer, it disappears, but you’ll still have a small countdown on your toolbar. What I really like about this extension is that when time is up, you don’t get this annoying buzzer that scares the crap out of everyone. A nice acoustic guitar riff plays alerting you and your students that time is up. This Chrome app was formerly known as Edcanvas. I’ve just discovered this one, and I’ve already begun sharing it with teachers in my district. Blendspace allows you to organize all of your links and documents onto a “canvas” or “space” so that your students can have instant access to all lesson documents in one place. This app really appeals to me because my district is a Google Apps for Education district, and you can also bring in documents from your Google Drive. In fact, you can sign in automatically with your Google account. I recently used this tool during a training on Rigor and Relevance by curating various news headlines. Teachers were able to click on the headlines that appealed to them, as well as see all the resources available at a glance. Here’s my Blendspace I used for that training: http://blnds.co/1gFaYQK. Please let us know how you’re planning to use these tools, or your experiences with them in the comments section below. If you have any tools you’d like to see featured on TechToolThursdays, feel free to suggest them below.